WASHINGTON — Talk about an unenviable position or simply what could be the worst job in the world today. 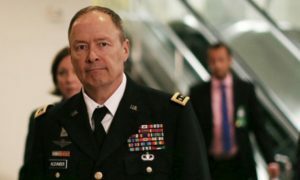 NSA Director and four-star general Keith Alexander had to defend his agency at a prominent hackers conference. Reuters reports he had to fight off a few hecklers, rhetorically, and he was attending the Black Hat conference where cybersecurity analysts and specialists meet to discuss policy and the like. The National Security Agency (NSA) has come under heavy scrutiny as leaker Edward Snowden revealed extensive domestic and international surveillance by the agency and U.S. allies. Snowden fled to Hong Kong then to Russia, where he remained trapped in a Moscow airport terminal since mid-June until receiving asylum on Thursday.